THE FARMYARD Friends section of the Ipswich Show was proving its popularity again yesterday. A wide variety of animals -- including llamas, alpacas, miniature goats and a Scottish breed of miniature Galloway cattle - were in attendance, along with their handlers who provided valuable education about the animals to show attendees. Graeme Sharpe is in charge of Farmyard Friends area, which has been in existence for a decade. Mr Sharpe said it was "a very popular area for the whole show". "It is a touch, feel, learn experience for everybody," he said. "They learn so much, not just the kids but the mums and dads too. With the mums and dads, a lot of that generation never got the opportunity to go to shows and see animals like we see today." Simone Walker is a fifth-generation dairy farmer from Rosewood and was on hand to educate the public. "Coming here gives us a good opportunity to show people what dairy cattle do for them, and they get to learn a bit," she said. "We teach them how we hand milk, how we use the machines and give them a chance to pat a calf while answering any questions." Ms Walker's young niece Zanade Schulz was very confident around the dairy cows. "She lives on the farm so she does this all the time," she said. 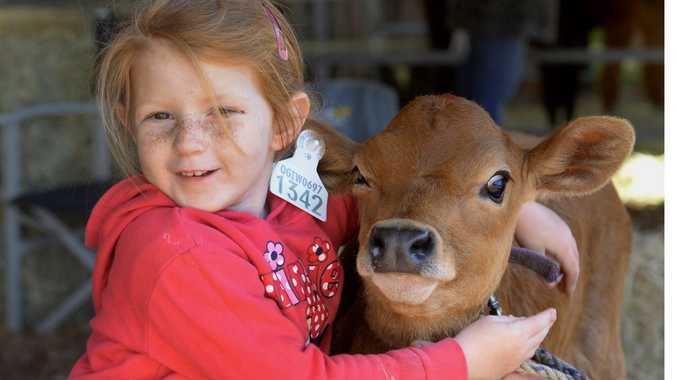 "It is great when you grow up around the dairy cows. You understand and appreciate them much more. It is good to give the kids an opportunity to learn from us and have a great understanding themselves."